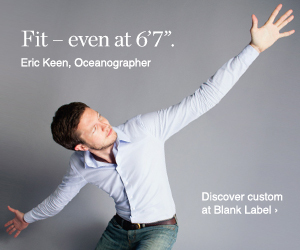 Teal Apparel is one of a growing number of specialist clothing brands set up to cater for the needs of tall men. These brands are typically set up by families who have experienced the struggle to find decent quality and fit for tall clothes and the Lallier family that set up Teal Apparel in 2010 is no exception. The ambition is to produce a line of affordable tall and long men offerings that place a premium on fit, function and form. For good measure, Teal aims to make absolutely certain to utilize only the finest materials and manufacture all of their range in the USA. Benefitting from previous experience in the clothing industry, Teal Apparel works in close conjunction with a New York-based design team to eliminate the compromise "that has always been the rock in every tall man’s shoe" when it comes to shopping for clothes. The current range comprises chinos in classic khaki as well as a range of more adventurous colors - stone, red, blue, black and gray. In line with the "tall not large" philosophy, waist sizes range from 32 to 38 inches and the inseam is 40 inches, which can be finished according to individual needs. Prices are currently around $90 per pair.